Solid enough start with the obvious stand out result against Liverpool. Keep it up! 7.5 average rating. 1 assist. 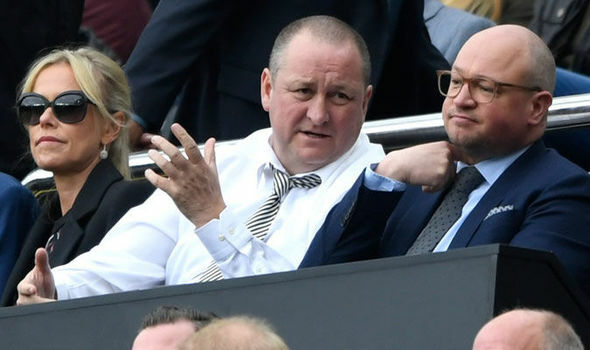 "We are listening to all parties who are interested in purchasing the club," Newcastle managing director Lee Charnley said in interview following former Nottingham Forest owner Fawaz Al-Hasawi's takeover broke down. "But we require more ambitious offers if we are going to sell." "It doesn't phase us," Kevin Nolan responded when asked how the talks and breakdown effected the team. "Realistically, the ownership of the club has nothing to do with what happens on the pitch. The players have nothing to do with it. We will let our results speak for themselves and keep moving forward, it's not in our minds." Newcastle have currently won all five home games in the Premier League, but have, in turn, lost all 5 of their away games. When asked about how the home advantage effects games, Nolan responded; "It's certainly a huge factor. St James' Park is absolutely rocking at the moment, and it makes it incredibly hard for away teams to come here and get a result, even teams like Liverpool and Arsenal. We need to work on our away performances, but if we can continue our home form, St James' will be a real fortress to come to." I remember Forest fans weren't too keen on Fawaz, so it's probably just as well that he hasn't bought the club either. Time for Amanda to make an offer! Good to see the Dark Lord perform well, been a while since Voldemort has had his time in limelight! 7.3 average rating. 3 goals. 1 assist. 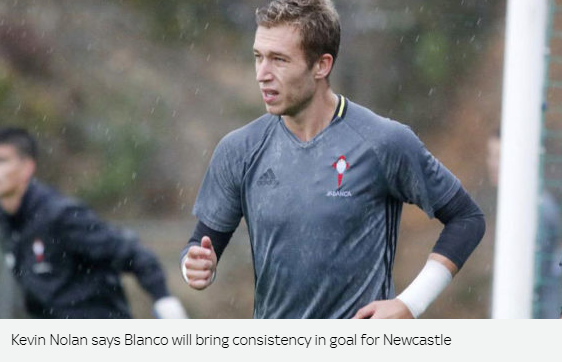 Newcastle have confirmed they will sign young keeper Rubén Blanco in summer, with manager Kevin Nolan stating that the Spaniard will bring consistency in goal. Newcastle have confirmed the purchase of young goalkeeper Rubén Blanco from Celta Vigo for a sum believed to be in the ball-park of £10m. Blanco will arrive at the club on the 1st of January as the winter transfer window opens. 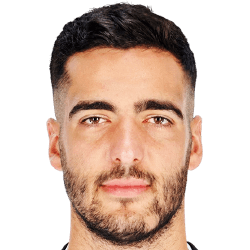 The 22-year-old, who has appeared 26 times for the Spanish u-21 side, has been in close contention this season with Celta's number 1, Sergio Álvarez. 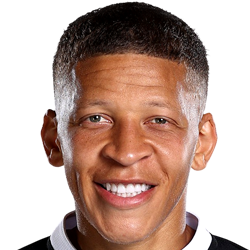 Newcastle have made use of both Karl Darlow and Rob Elliot in goal in the Premier League so far this year, with both keepers failing to prove themselves to new manager Kevin Nolan. Slovakian loanee Martin Dúbravka is yet to make a first team appearance. "He's a fantastic young talent," Nolan said when asked about Blanco. "Not only does he have massive potential, but he's already got a lot to offer the team. Rubén will bring consistency to the goal." Sceptical one, let's see how he does! St James’ Park is serving you a lot of good. Just to find the away form and who knows what could happen! I’m not too familiar with Blanco so I will reserve my judgements for now. Hopefully he works out for the Toon. 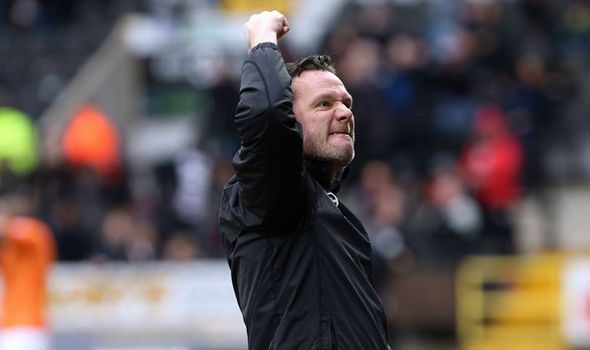 Kevin Nolan has "plans in motion" as he signs a new 2-year-contract. 7.3 average rating. 2 goals. 1 assist. Newcastle manager Kevin Nolan has signed a new contract with his club which will see him in charge for the next two seasons. 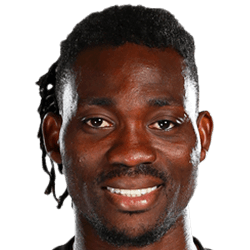 His previous contract was set to expire at the end of the season, and question marks were being raised as to if he would remain with the club. "I'm very excited," Nolan said after his renewal was announced. "I have already been thinking about the long-term future of the club in recent months, but I can really start to get stuck in now. I can set my plans in motion. Both the team and I have massive ambition and I'm really happy that I've been given time for my plan to work." When asked if the clubs targets have changed this season due to surpassing expectations, Nolan responded; "Our current goal is to just distance ourselves from the relegation zone completely. We have a lot of points on the board right now and we want to keep picking up more to just guarantee our safety. After we make sure we are safe we can think about other things." Still unbeaten at home! What a fortress it's becoming. Looking amazing at home still. A shame about the loss in the cup, as it's always nice to win a bit of silverware. Two interesting signings too, looking forward to what they bring to the table. 2018-05-09 11:18#249266 Aaron : Still unbeaten at home! What a fortress it's becoming. It's always my aim, I love good home form so I'm glad it's working. 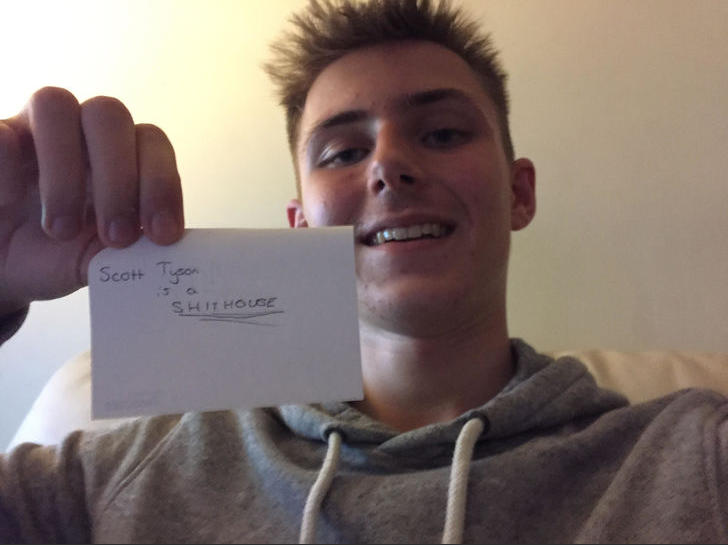 2018-05-09 15:37#249268 ScottT : Looking amazing at home still. A shame about the loss in the cup, as it's always nice to win a bit of silverware. Two interesting signings too, looking forward to what they bring to the table. Yeah I didn't expect to win it in my first season but I'm going for every cup I can get. 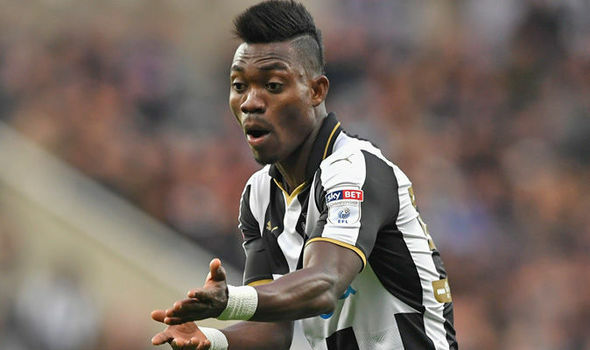 Newcastle have struggled in January after being hit by a handful of injury setbacks, with not a single Newcastle player netting a league goal. 7.6 average rating. 3 goals. 2 assists. Watford and Stoke pick up the pace in February, rivaling Southampton, Bournemouth, and Newcastle for a top 9 position. 7.2 average rating. 1 goal. 1 assist. 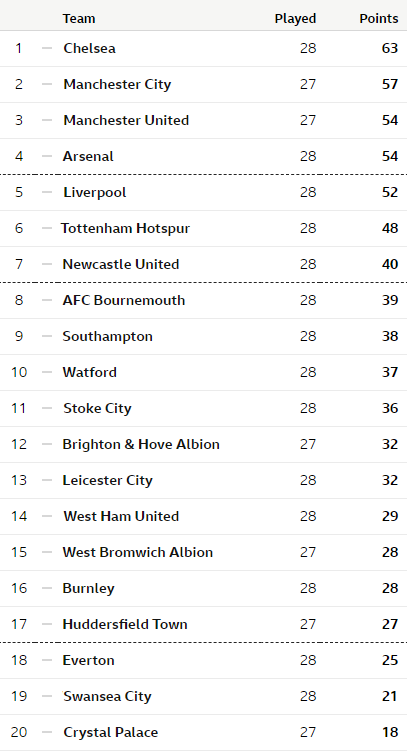 The European-placed teams are beginning to pull away from the rest of the league, with 5th placed Liverpool being a convincing 12 points above 7th placed Newcastle going into March. With ten games to go, Chelsea are in the best position to win the league and retain their title, but both Manchester teams are close behind. Crystal Palace remain favourites for relegation, languishing 9 points below the currently safe Huddersfield. Swansea City accompany Palace in the relegation zone along with the grossly under-performing Everton, who have the most defeats in the league so far despite their reputation. 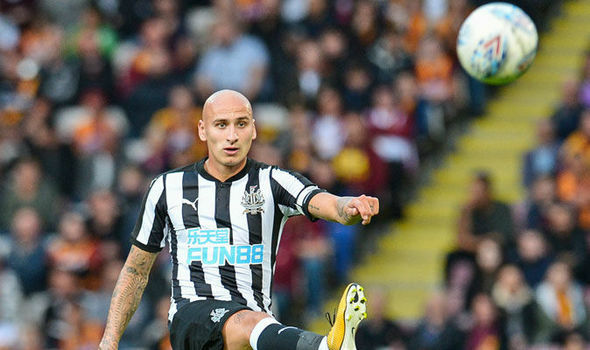 Newcastle are the most recent club to hit the magic 40-points total, which almost ensures safety from the drop. Manager Kevin Nolan has been praised for guiding the team in to it's solid position despite being one of the lowest spending teams in the league. Ex-Newcastle manager Rafa Benitez's Arsenal team currently sits at 4th in the league, on equal points with 3rd placed Manchester United. Watford and Stoke now join the south-coast teams and Newcastle in the push for a top 8 position, with all 5 teams in good form as of late.